The bicycle is an elegant example of basic science principles – forces and motion, energy, material science. 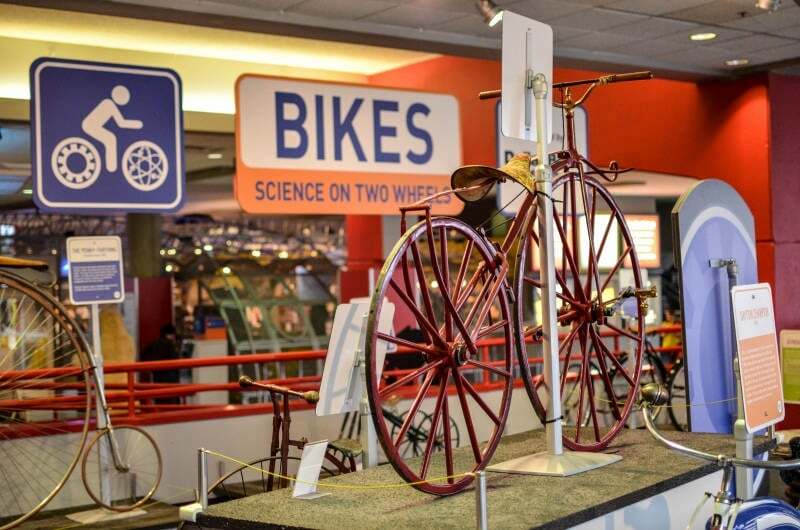 Organized by Carnegie Science Center, we are proud to present GEAR UP: The Science of Bikes, a temporary exhibit opening on Saturday, May 18, 2019, that will run through the year. 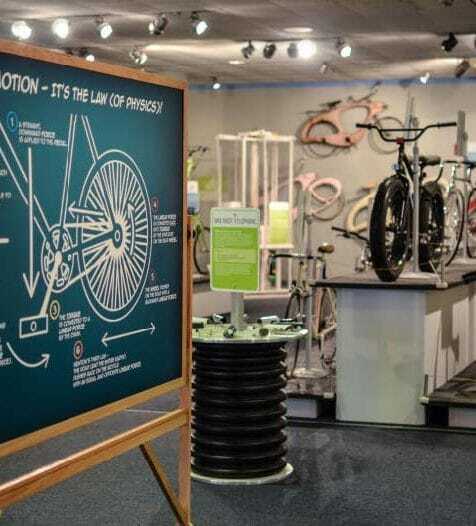 Get the first look at the EcoTarium’s new exhibit, GEAR UP: The Science of Bikes on opening weekend. The celebration includes riding demos, tons of hands-on activities, and a bikes obstacle course for kids. May is Bike Month, so grab your helmet and join us for a wheelie fun time! Bicycles have come a long way since the days of bloomers and velocipedes. Whether you’re speeding down a mountain or touring the town, our legs provide the power, and science does the rest! Visitors take a seat on a rotating stool, spin a hand-held bicycle tire, and see how the rotational forces move them as they turn the tire from a vertical to a horizontal position. 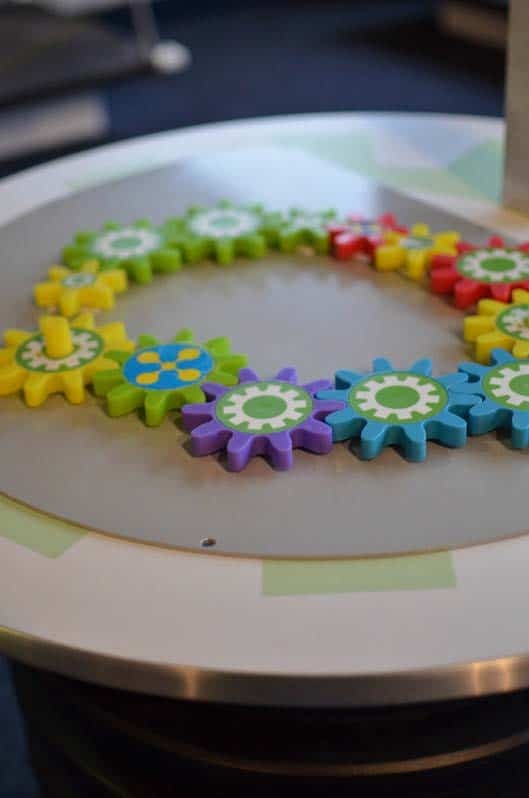 For younger visitors, a simple table of magnetic gears allows them to experiment with simple interlocking mechanisms of their own making. Visitors watch three shapes race through pearlized fluid, seeing which shape’s design is the most aerodynamic, as it relates to helmet design. Visitors make their own tread rubbings, as they study variation in tires for variations in sports and terrain. Visitors try to identify stop sign from a set of nine samples, seeing how the brain recalls color. In an accompanying display, as series of high-tech coatings samples runs the gamut of color and finishes. Visitors change the ratio of three colored lights, to change the apparent color of some miniature bikes, to see how the eye perceives color, and how colors in the visible spectrum work. Visitors put on the brakes on this spinning disk, using three different pads to see how materials affect friction. A series of tubes of different materials is ‘played’ by the visitor as they explore why bikes can be made from so many alloys. A hand-held ‘bike’ with square wheels can smoothly traverse terrain made of ellipsoidal hemispheres. A hand-cranked set of gears produces electrical power, as visitors learn about the transfer of mechanical energy. An old school chalkboard explains the mechanics of bicycles on one side, and the transfer of energy involved when a rider hits the trail – from the sun to food to you to the bike!